In case of tooth implantation if the available bone quantity or quality is insufficient to ensure the stability of the implant. 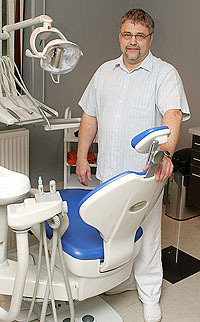 In case of a tooth bed disease, when the teeth are no longer securely fixed. In case of extended bone damage (for whatever reason). 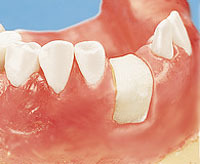 Before tooth implantation if the prosthesis is to be inserted at the lower end of the sinus. 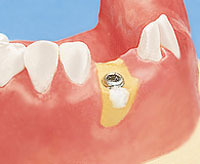 After the removal of tooth roots or a cyst. It is important that the body should fill the bone deficiency with natural bone tissue and not with “useless” callus tissue. For this reason, the place of the bone tissue must first be filled with a material that acts as a place-holder for the bone to be generated. Osteoplastic (bone grafting) materials actually do not replace bone tissue but stimulate its generation by acting as a frame for the natural bone to be generated. Osteoplastic materials gradually disappear from the newly generated bone; both the structure and the function of the new tissue will be the same as those of the original bone. 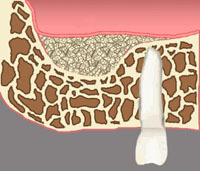 One way to graft bone tissue is using human-originated bone grafting granulate or a piece of bone (a so-called “bone block”). The material, gained from the human body, is cleaned and sterilised with a special procedure. The result is an inorganic structure mostly consisting of calcium and hydroxyl-apatite. The gum is incised and the strongly atrophied area is filled up with the granulate, or the bone block is affixed with small titanium screws. The block is built into the patient’s bone after the gum incision is closed. The other bone grafting method involves building the patient’s own bone, usually removed from the hip bone, into the jaw. This operation is recommended in case of severe bone loss; it allows for tooth implantation even in cases that were previously believed almost hopeless. The third option involves the usage of synthetic bone grafting materials. These are inorganic materials similar to the components of bones. As to their form, they are granulates or porous materials. The area treated with osteoplasty must often be covered during the healing period; this is achieved with a so-called membrane. There are dissolvable and non-dissolvable membranes. If necessary, a membrane can be affixed with titanium studs. Minor bone grafting is performed at the same time as tooth implantation. In more severe cases, grafting precedes tooth implantation by at least six months. The more time elapses after tooth extraction, the thinner the bone tissue will be. 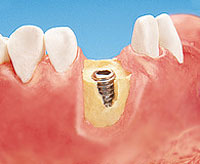 In bad cases, the remaining bone is not enough to support even the smallest implant. This is when the sinus-lifting operation is necessary. 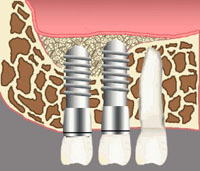 The operation is usually performed when the implant screw is inserted. 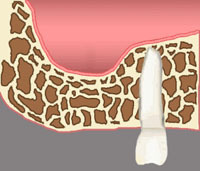 The mucous membrane that the sinus is “lined” with on the inside is elevated as necessary (usually by a few millimetres) where the implant will be, and the resulting gap is filled with osteoplastic material. The implants are inserted into the bone thus thickened. How the implants are slowly built into the bone is checked via radiographic imaging. If the original bone thickness is less than 3-4 millimetres, then six months of healing is necessary after the sinus-lifting procedure; it is only then that tooth implant(s) can be inserted. A synthetic bone grafting material that is fully absorbed by the body in a few months, to be replaced by freshly generated bone tissue. It is made of pure ß-tricalcium-phosphate, which ensures bone regeneration. The bio-plastic (poly-lactic acid) added to the granulate, also called Biolinker, generates a sticky film on the granulate, so it can be placed as desired accurately, swiftly, and without loss, with a special dosage syringe. Then it solidifies rapidly. The thick film also prevents the proliferation of bacteria. Osteoplasty with Easy-Graft does not require a membrane. The Bio-Oss bone grafting material is made of minerals gained from the bone of Australian cattle. During processing, all organic material is removed, leaving only calcium compounds. During healing, the granulate is built into the existing bone tissue, gradually absorbed by the body, and replaced by newly generated tissue. Bio-Gide membrane is made of collagens gained from animals. Collagen protein is the main building block of skin and connective tissue; it promotes wound healing and allows for optimal bone regeneration. A membrane consisting of pure collagen, made of bovine pericardium. With a special preparation procedure, the raw material is cleaned of enzymes, lipids, and non-collagen proteins. Controlled lyophilisation (drying in combination with freezing) ensures a loose fibre structure which allows for optimal incorporation into the original tissue. Put a cold pack on the swelling. Take a painkiller if necessary. When brushing your teeth for the first time after the operation, avoid the area operated on, and use anti-bacterial mouthwash. After one week, clean the area surrounding the wound with a soft tooth brush. Do not drink coffee or alcoholic drinks, and do not smoke for 2-3 days after the operation. These measures help prevent bleeding, and promote the healing of the wound. Heavy smoking and poor oral hygiene deteriorate the effect of the treatment. Honour the check-up appointment with your dentist even if you feel that the healing process is entirely smooth.